Luxury and prestige as well as sportiness and styling are some of the traits you expect from an Audi. Because Audi maintains the reputation of developing cars with the highest level of technology, performance and power, you want to make sure you trust your Audi service issues to the experts. At Orr Automotive, our history and success has been built on our knowledge with foreign automobiles and our commitment to Audi service excellence. 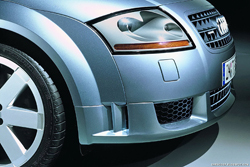 A large number of people believe you must have your Audi service done at an Audi dealership. If not, you will void your new car warranty. This is not true. They also believe the technicians at the dealership should be better able to handle their service issues. This is also not always the case. If you want to keep your Audi running at its peak performance, it's important to trust its Audi service work to the experts who care. We've not only worked on countless foreign cars during our business lifetime, we believe in the importance of the safety and reliability of your car. 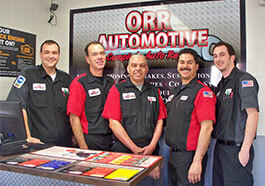 When it comes to your car, contact Orr Automotive for your Audi service needs. We have been serving Audi owners in California since 1980′s, and we are certain we can help you with any of your Audi repairs. When you bring your Audi to us, our objective is to get you back on the road as quickly as possible with the least amount of hassle. From simple oil changes to handling more serious Audi repair issues, our technicians have the up-to-date training and state-of-the-art equipment for quick and accurate Audi repair. The best way to minimize more serious breakdowns and the higher costs associated with repair issues is through preventative maintenance. Audi maintenance schedules are designed to make sure your car is well lubricated and running in its best condition. Taking an active role in the maintenance of your Audi is necessary to protect not only your investment but to also help you avoid costly repairs as well as optimize your Audi's performance, safety and fuel efficiency. There are factory-recommended service intervals for your Audi. Relying upon these intervals will only help you get the minimum life out of your car. Your Audi's daily interaction with the deteriorating road conditions in CA, along with your individual driving style, will dictate how often you should perform the routine Audi maintenance tasks. Repairs can often be avoided with routine maintenance, and Orr Automotive is well-equipped to advise you on the best maintenance schedule for your Audi. 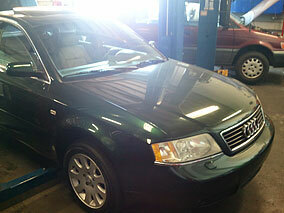 For all your Audi maintenance, periodic service or Audi repair needs, contact Orr Automotive!